The quiet rural community of Livingston, population 664, is located where County Highway E and State Highway 80 meet, halfway between the city of Platteville, home of University of Wisconsin – Platteville, and the town of Fennimore, home of Southwest Wisconsin Technical College. Livingston is in the Iowa-Grant School District. A post office called Livingston has been in operation since 1880. The village was named for Hugh Livingston, the original owner of the town site. A meteorite fell to the Earth near and in the village on April 14, 2010, following a spectacular bolide and aerial explosion seen over much of the Midwestern United States. 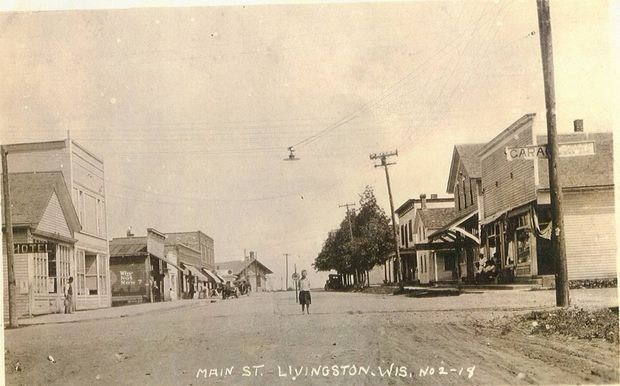 "The village of Livingston was founded on the property owned by Hugh Livingston, Sr. and later on part of the William Thompson land. Mr. Livingston sold the right of way for the railroad. The village was started in 1880 and the land was surveyed for a branch railroad from Madison to Galena. It was named the Chicago and Tomah railroad and later was known as the C.R.W. The last spoke was driven Feb. 13, 1880. Settlers began to arrive and business places were established. The first building erected was a high-front building that was moved from Annaton and was placed on the ground, where the W.F. Alton house now stands. It was used as a restaurant. The James Allen family lived in the building and Mort Allen, now deceased, was the first child born in the village. It was later occupied by Mrs. Lib Wheeler. The next building was the hotel which still stands." Livingston, Wisconsin has building sites available for industrial development. Contact the Clerk for full details at (608) 943-6800. Water, sanitary sewer, natural gas, and three-phase electricity are available at the community’s Business Development Site (which is located on State Highway 80 at the east edge of the village). Plenty of acreage is available. The sites are nearly level, has good soil conditions, and is well drained. The village is conveniently located to Platteville (13 mi. ); Fennimore (17 mi. ); Dubuque, IA (35 mi. ); and Madison, WI (65 mi.). There is a workforce of more than 16,000 people and a total population of over 30,000 within a 20 mile radius of Livingston.